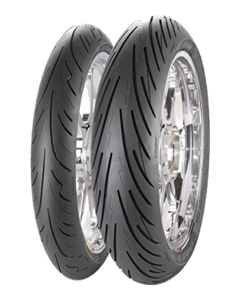 The Avon Spirit ST is a Premium Touring Summer tyre designed to be fitted to Motorcycle. The Spirit ST is the successor to Avon's acclaimed Storm range and has been designed to provide excellent levels of wet grip, together with superb handling on a wide range of popular sport-touring bikes. Featuring a radical new tread pattern, the Spirit ST uses the very latest high-silica synthetic rubber compounds for improved mileage. Highly loaded silica compound combined with state of the art polymer technology for excellent wet and dry traction and handling. Interlocking three dimensional points hidden in the sipes to improve stability and grip, limit tread flex and allow the tyre to warm up quickly (3D Sipes). Avon’s latest technology construction design gives ultra high performance handling and stability characteristics. Multi-compound rear tyres for all round tyre performance (TE). Covered by road hazard warranty (only available in UK and North America).